Public Services and the communities they serve are facing some pretty big challenges. We don’t always have the answers to these. The GovTech Catalyst is a new scheme created by the UK Government that aims to help technology firms develop innovative fixes to public sector challenges. Monmouthshire’s successful bid to the GovTech Catalyst resulted in an allocation of up to £1.25m of Cabinet Office funding to encourage technology firms to develop and pilot solutions to loneliness and limited rural transport. Firms have a free reign to suggest solutions via a pre-commercial procurement (PCP) process called the small business research initiative or SBRI for short. In Phase 1, five potential projects will be selected to receive funding up to £50,000 each to cover research and development costs. The best of these could be awarded funding up to £500,000 in Phase 2 to turn these potential solutions into viable products or services. Monmouthshire is a semi-rural county in South East Wales with a population of around 93,000. We are blessed with diverse and beautiful surroundings, thriving towns and vast amounts of social capital. Yet the diversity of our landscape has it’s challenges. Loneliness has a significant impact on people’s health and well-being. There is a direct correlation between loneliness, our increasingly ageing population and the unravelling of our sense of community. Reducing budgets in public services also means there is less money available to subsidise traditional transport services. This is a major issue in rural areas where journey times on public transport to a local services can exceed two hours. As a result residents are heavily dependent on private cars which is costly, both financially and environmentally exacerbating problems of loneliness and making it harder for young people to access training and employment. How can we use technology to improve our interaction with older people to reduce loneliness whilst alleviating digital exclusion? How can we co-ordinate transport more efficiently to increase peoples’ ability to travel in rural areas whilst reducing public subsidy? How do we better connect people in rural areas to improve well-being and reduce pressure on the health and social care systems whilst improving service efficiency? Applications were welcomed from companies who can develop solutions to one or more of these parts. Through the SBRI approach, we will get an innovative, bespoke solution that tackles our challenge head on. Successful applicants will receive funding for research and development and will retain the intellectual property with a stamp of approval that will help firms attract global interest to sell their product to others. Our challenge opened on 16th July and closed for applications on the 5th September 2018. We were extremely surprised and pleased by the high level of interest that the challenge attracted. 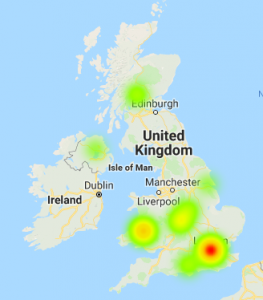 108 interested parties registered for the challenge via the Innovate UK portal and from this 57 applications were received. Applications were made from all over the UK, 14% of which were applications from businesses based in Wales. 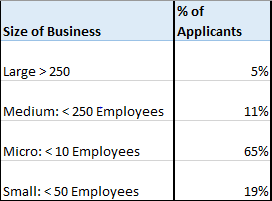 A focus of the Small Business Research Initiative (SBRI) approach is to stimulate and support growth for small businesses and so it was excellent to see that 65% of the applications were from micro businesses (<10 employees). Following the assessment of the applications via an independent Innovate UK panel, five contracts have been awarded to undertake innovative projects. These projects will include a range of digital technologies, like apps, websites, online channels and text services. The five companies will explore how to integrate with existing channels such as a landline and voice responsive tech to ensure accessibility for all. Vehicle tracker data, existing resources and open data sources will also be scrutinised to improve services and enhance wellbeing. We look forward to providing additional updates as the funded projects progress.